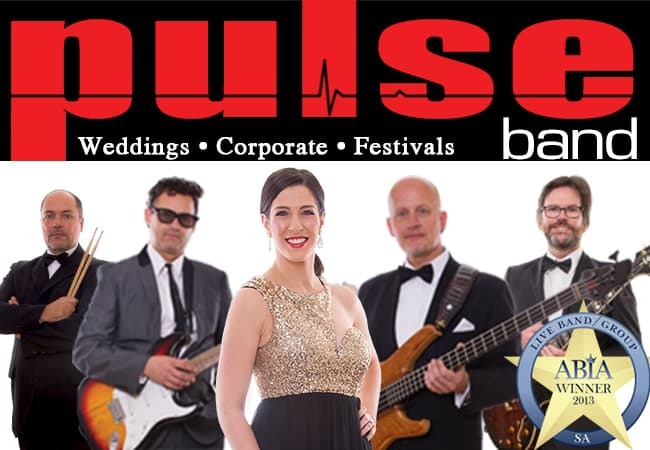 Pulse band’s extensive and eclectic play list covers songs to suit many generations: from the ’50s, ‘60s and ‘70s, to the ‘80s and the ‘90s, all the way to the current top 40 hits. Whatever your preference or theme, Pulse band brings the music alive with the skill and talent of experienced musicians. Whatever your preference or theme, Pulse band brings the music alive with the skill and talent of experienced musicians. Performing popular songs from Ed Sheeran, The Beatles, ABBA, P!nk, Amy Winehouse, Bruno Mars, Shania Twain, Maroon 5, Rihanna, Elvis, Neil Diamond and many more. Pulse band’s playlist is developing and changing constantly to cater for all types of requests and occasions. So if you don’t see your favourite songs listed below don’t worry. Just ask Tony and Pulse band will endeavour to accommodate your selections. Pulse band can sing almost any song in Italian and their repertoire also includes many of your favourite Italian songs. Just the thing to make your special wedding day even more memorable. Simply talk to Tony for more information. ‘The Classics’ and party dancing songs from the 50’s to current Top 40 Hits suitable for parties, weddings (when the party gets cranking), corporate functions, festivals and any celebration. Combine this with easy listening, smooth jazz, classy lounge and dinner-dance style songs then you have a versatile and dynamic mix of music for every heartbeat.